In today's post, Julie Fryer from Maple Tapper is going to give us the details about beginning a sugaring operation, that is how to tap trees for sap to make maple syrup. She also contributed several photos. Throughout this post in italicized red I will share my thoughts. I was compensated for this post with two free maple tapping kits, one of which I am giving to my friend for allowing us to tap her trees. Have you been waiting to try this hobby because it seems too complicated? We promise that this is one of the easiest to learn and most fun for the family hobbies we’ve ever tried. Tapping maple trees is an age-old activity, the process is not complicated, and you can easily learn everything you need to know in one season. 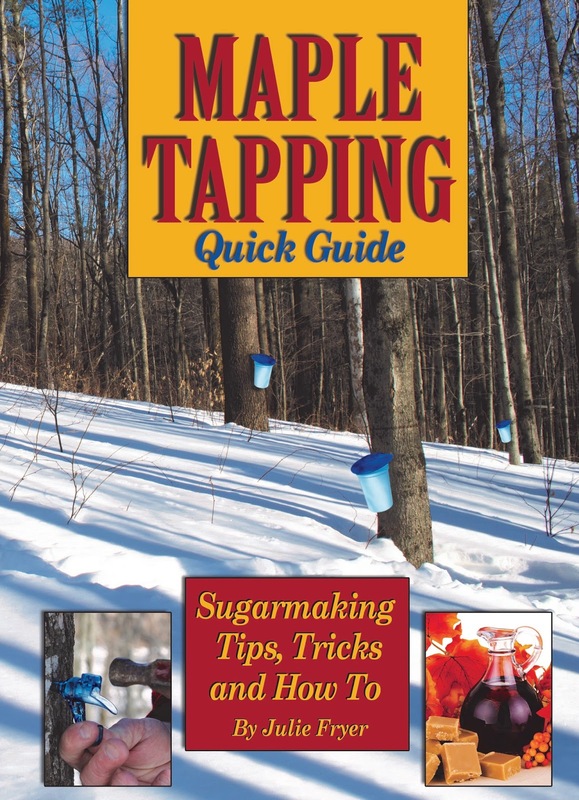 Much more detailed information can be found in our book, Guide to Maple Tapping, which is included in every kit and also available electronically. Step #1: Assemble your tools. Spiles and either tubing or an all-in-one system with the spile integrated into the lid/bucket or sack holder. Collection containers such as buckets or gallon jugs with lids. Avoid containers that have held milk, pickle juice, or oily substances and do not wash with dish soap – these all can impart weird flavors to your sap. Kitchen utensils; pots for cooking; a way to boil your sap and glass jars with lids. Step #2: Find a tree or two. 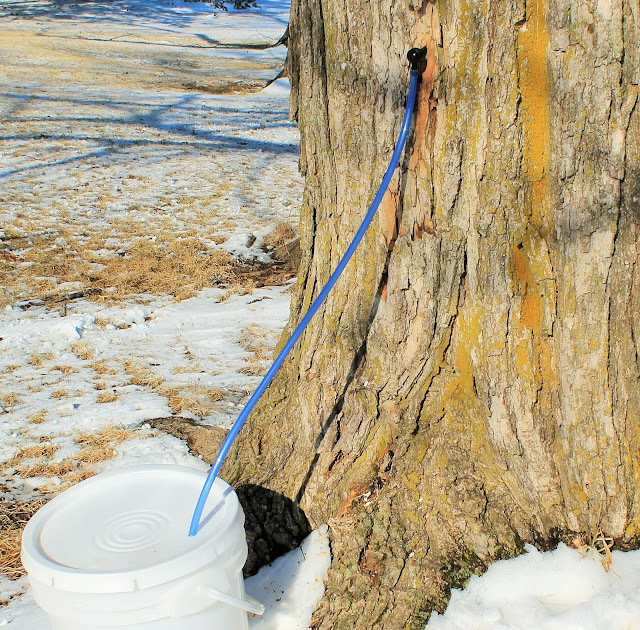 The best choice for the sweetest syrup is to tap a sugar (or hard) maple tree. You can also tap the red or silver maple but the sugar content is lower so you’ll have lower syrup yields and longer boil times. There's more information on that in our book. Consult an illustrated tree reference guide for more details on identifying types of trees. John and I don't have any maple trees on our property, but we were able to network with another crunchy family that lives a few minutes away. Lisa and her husband have 2 sugar maples in their yard, and are gracious enough to tap their trees with us! Over the entire season, you can expect approximately 10- to 12-gallons of sap per taphole which will boil down to about one quart of syrup. Trees can handle more than one tap but make sure you as a new sugarmaker can handle more than 10 gallons! You do not have to own a plot of land in the country to find maple trees. Town syrup is just as sweet as country syrup. We will be making town syrup! Y'all know that town dwellers can do anything that folks in the country can do. Step #3: Watch the weather. What you’re looking for is a forecast that includes a pattern of cold nights but warming days. Sap starts to run when nighttime temps fall below freezing but daytime temps get into the 40°Fs. This usually happens around late February and lasts until mid-April. Once you see this pattern, it’s time to get out there and tap your trees. 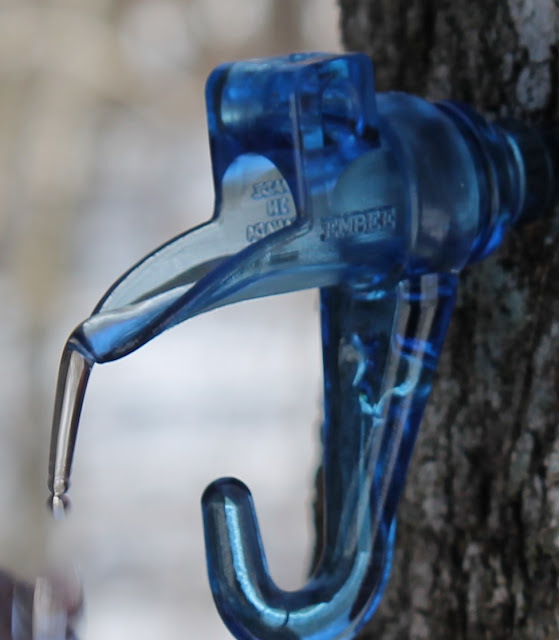 Remove your taps when you have enough sap or when the tree buds out as that can lead to an off or “buddy” flavor in the finished syrup. Our weather here in Eastern Iowa is perfect for tapping. We will begin this weekend. No matter what system you choose, the drilling procedure is the same. The only variation is the size of drill bit needed – most of our kits use a 5/16” spile so that is the size drill bit you’d need. 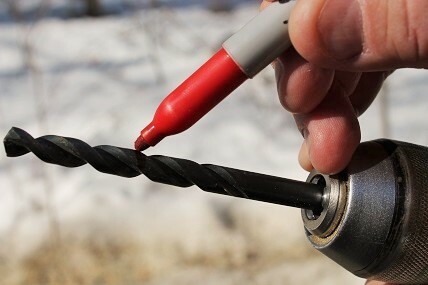 Select a wood-boring drill bit and mark it with tape or a marker at 1½” from the end. This mark will show you where to stop drilling so you only go into the sapwood. Pick a spot on the tree trunk approximately four-feet off the ground below a large branch or above a large root. If using a bucket or jug that will sit on the ground, be sure your tubing will reach the bucket even after the snow melts underneath it. Drill at a slightly upwards angle into the tree and do not go deeper than 1 ½”. Shavings that come out of the hole should be creamy or light yellow and sap will most likely start running immediately. Once the hole is drilled, you simply insert the spile, gently tap it in with a hammer until it feels snug, and attach your bucket, jug, or bag to collect sap. This tap will stay in the tree for the entire season. Each day, you will come back to the woods to collect your sap. 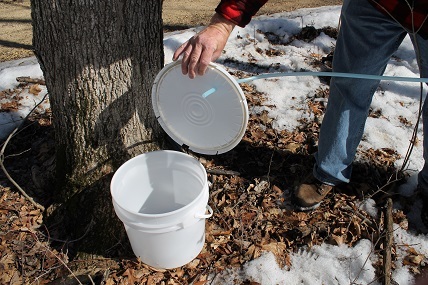 Sap left sitting in buckets can grow bacteria – this is not harmful as the sap will be boiled but the bacteria will eat away at your sugars which will affect the syrup’s taste. If you can’t boil your sap every day, it can be chilled for a few days until you’ve collected enough to cook. We scored some used food grade plastic buckets from a local restaurant that we will use for sap collection. Yay for repurposed supplies! Step #5: End of Season Chores. 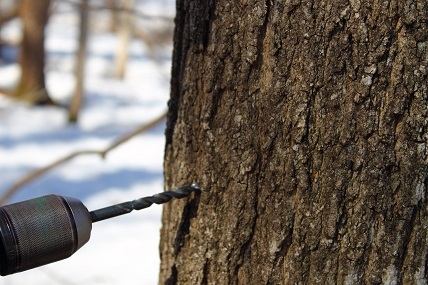 Once you’ve collected enough sap or the trees bud out, simply pry the spiles from the tree with a small claw hammer. The taphole will heal over the summer and the same tree can be tapped year-to-year, although you cannot reuse the same taphole. Thoroughly rinse all of your equipment – do not use detergents – let air dry and store away for next season. Look for a second post on our experiences sugaring. Julie will share some expert information, and Lisa and I will share our thoughts from our first time. Are you sugaring this year? Tell us about your experiences! I'm so excited to share this hobby with you and your readers! I hope everyone dives in and tries it this year. My hubby and I will be out tapping over the next few weeks and I'm happy to answer any questions that folks have. Just email me directly at Julie@mapletapper.com. Happy Sugarmaking! !